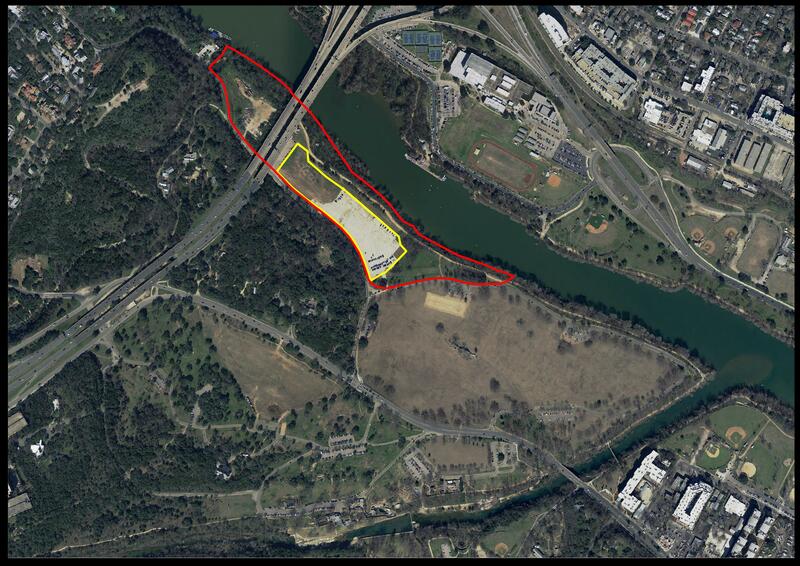 Yellow outline indicates location of permanent staging area and parking lot (about 7.5 acres). Red outline indicates location of closed landfill. Click image to enlarge. The Butler Landfill in Zilker Park was operated by the City from 1948 to 1967. It is entirely within the boundaries of Zilker Park and extends along Stratford Drive from just west of the Mopac Bridge to Lou Neff Road and the "Great Lawn" of Zilker Park. The landfill was closed in 1968 and cover soil was placed over the site. In 2002, additional cover was added to shed water and reduce rainfall infiltration that could create leachate from the landfill. It became an open green space with grass until the City started allowing this park site to be used as a temporary staging area for the ACL Music Festival (ACL) and overflow parking. Over the years, these increased staging and parking activities have disrupted or damaged the cover overlying the landfill. In 2016, the City's Park and Recreation Department (PARD) brought in loads of crushed rock, covering much of the grass, to allow wet-weather operation of the staging area for ACL. PARD said this was temporary. In 2018, PARD proposed a much larger permanent staging area for ACL. The stated purpose of the project was to protect the landfill cover so that ACL staging could occur for one month of the year with an accessory use to allow increased parking for other Zilker activities and events. However, this is inconsistent with the Parkland Events Task Force recommendation to develop a parking and traffic solution for parks that would reduce usage of green space parking. While ZNA appreciates the need to protect the landfill cover, we are also concerned about turning park land into a permanent parking lot. The ZNA Executive Committee opposes the project as currently proposed.